Printer's Furniture is more than just those blocks of spacing we use to lock up forms in the chase of a letterpress. Quite a bit of the wooden Industrial furniture in use in the old print shop was as well-built as those adored antiques that folks buy and sell with such interest these days. 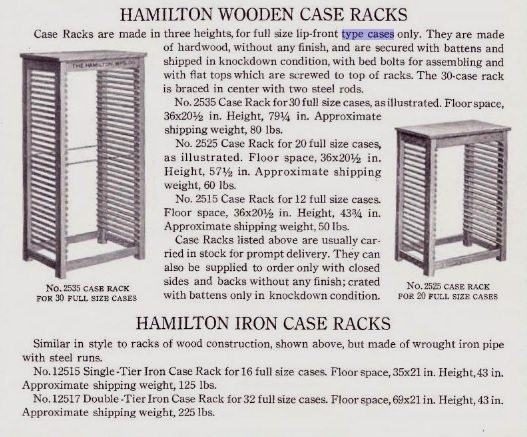 The most well-known name in Print Shop Industrial Furniture is Hamilton - also known for their Wood Type. Thompson Cabinet Company also made type cases and galleys - and the cabinets to store them in. There were, of course, others - many others, in fact - often attached to a type foundry or press maker. 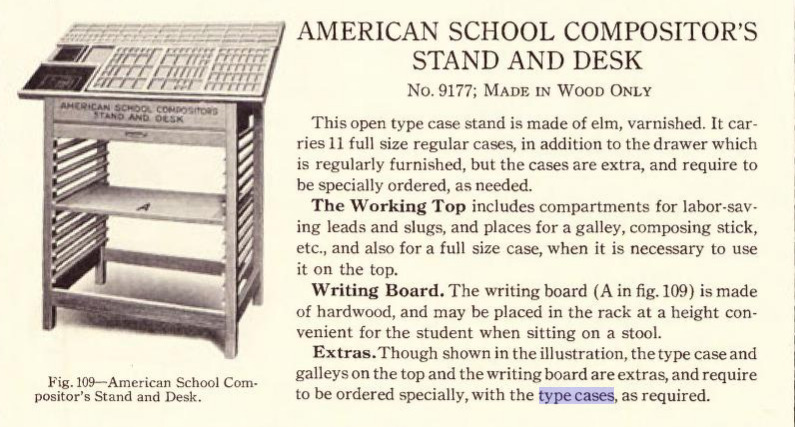 American Type Founders also sold type cabinets - made by Hamilton. Their name is stenciled quite clearly on the Old City Stand we are restoring for Case Western University in Ohio... I believe that was the shipping address.... which may have been stenciled on many Hamilton cabinets. Below are a group of images scanned from the 1923 ATF Catalog. The cabinets they sold were made by Hamilton. The Standard Wooden Case Stand was available in a variety of configurations - one stack, two stacks, and combinations to hold both full sized and combined with 2/3 size cases. The City Case Stands shown below were more comlex and included additional shelving and case support on the top. 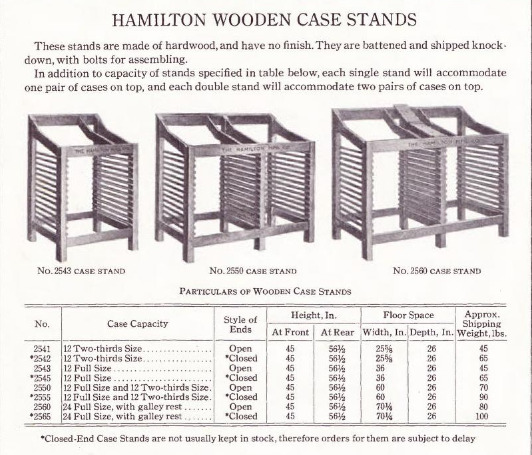 The Hamilton Wooden Case Racks were made in 20 and 40 case heights. These racks had flat tops and were used for efficient storage, whereas the "stands" including sloping work tops. 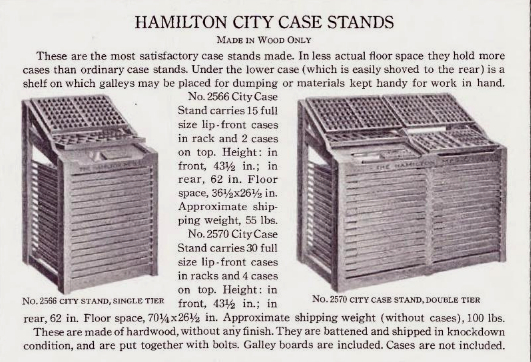 The Hamilton City Case Stands were meant to be used as composing work stations. Two cases could be set on the top of each column of cases. When the job was set, the case could be returned to the rack where it was stored. These are the most common style seen in (accurate) historical collections. Similar styles were in use since Gutenberg's time - and were popular until the newer style cases - which would fit in steel-runner "dust free" cabinets and become the standard after 1900. This is the one we are restoring. The School Compositor's Stand and Desk served a dual purpose. Not only would it hold 11 full size cases, but it also includes and expanded working top and writing board. This was seen in the many schools that offered "shop" classes in printing - as they did with other trades of the era.